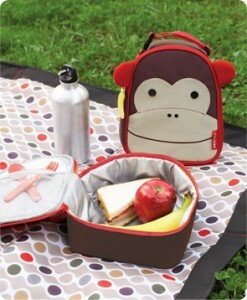 How cute is Middle’s new Skip*Hop Monkey lunch bag from their Zoo Lunchies collection? The minute I opened the box, his boring, old lunchbag was pushed aside in favor of the monkey, for all its personality. I was a little worried about the size, because it seemed smaller than his other bag. But it fits a sandwich, apple, side snack and a reusable bottle into the bag, plus a cooler pack, napkin and utensils. In addition to its easy wipe-ability, I love that the carrier strap hooks on to other bags, like Skip*Hop’s Zoo Packs, as well as bags not made by Skip*Hop. Thanks to Skip*Hop fro providing a sample.